On Tuesday night, before President Trump took the stage to give his State of Union address, Michael Rubin gave a talk at the University of Michigan titled “The Iran Deal, Iran Protests, and the Future of the Middle East.” Michael Rubin is a resident scholar and historian with the American Enterprise Institute who focuses on Iran, but also studies Turkey, Iraq and other Middle East countries. Rubin focuses on these countries and looks at how US policy toward them has shaped their futures, and also writes about how we should treat these countries in the present. He has made numerous media appearances, including his most recent appearances on Fox News’s “Fox and Friends” discussing border security and CNBC’s “Power Lunch” discussing the recent Iran protests. In his most recent book, Dancing with the Devil: The Perils of Engaging Rogue Regimes, he examines the pitfalls of attempting to negotiate with “Rogue Regimes,” from North Korea to the Palestine Liberation Organization (PLO). 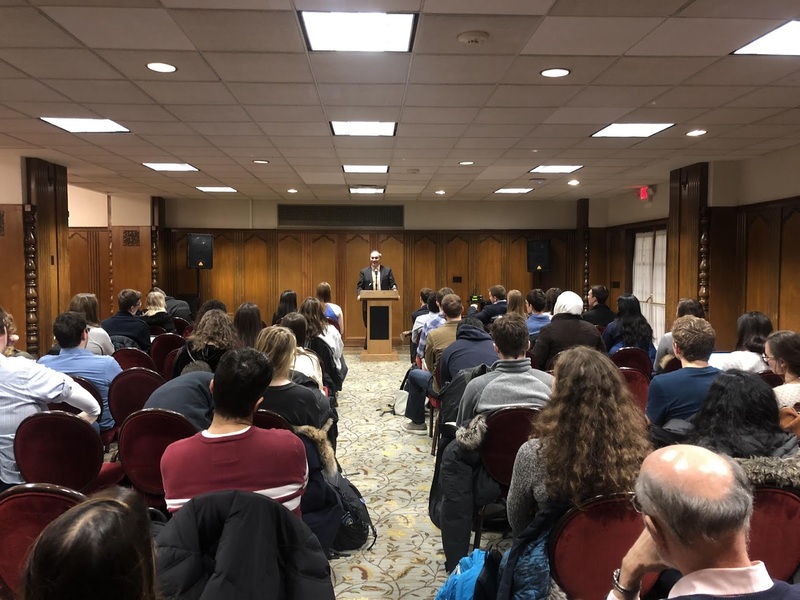 He started off the event by outlining the purpose of the talk: to focus on things that “are not necessarily on the front pages of newspapers” but still deserve equal attention and discussion when thinking about the United States and its policies toward the Middle East. He then delved into his feelings on the Joint Comprehensive Plan of Action, commonly known as the “Iran Deal.” The details of that plan includes a reduction of centrifuges in Iran, as well as a reduction of Iran’s Uranium capacity and stockpile, which would be verified by inspections from the International Atomic Energy Agency, otherwise known as the IAEA. The United States and the European Union in turn agreed to reduce nuclear and economic sanctions on Iran if they complied with the deal. Most notably, the deal includes a lifting of economic oil sanctions in early 2016, which released over $100 billion in assets to the regime. This deal has been considered a hallmark of the Obama Presidency. The former president, as well as former Secretary of State John Kerry, have hailed the deal as having an overwhelming positive influence in the region. However, while there are those who support the deal, many conservatives in the US are against the Iran deal as they feel it will not stop Iran from obtaining nuclear weapons and instead lifts many of the sanctions that kept them in check. This led US Senators Bob Corker of Tennessee and Ben Cardin of Maryland to author a bipartisan law that stated that the Iran deal had to be reviewed and re certified every 90 days by the President in order to continue. In October of last year, President Trump announced that he would refuse to re-certify the deal by the next deadline, saying that Iran was violating “the spirit of the deal.” This in turn led to much controversy and criticism, as many people were divided on the issue. Michael Rubin addressed the deal by saying he tended to be against it, as the premise of progressivism that the deal was outlined under was faulty to begin with. This premise or idea is that the newly elected reformists in an undemocratic country can show that acting responsible was better than continuing to act in nefarious and degrading ways as a regime. This, many progressives believe, forces these countries to become democracies and change their ways. While I disagreed with some of his points, I found the event to be illuminating, full of perspective and insight into a country and a region that will continue to be analyzed for generations to come. This idea was brought up at a feverish rate when Hassan Rouhani was elected President, as many believed he was the reformer of Iran that the world had been waiting for. Rubin responded to this by saying that while that view is not always false, many negotiations with rogue regimes generally did not cause these regimes to turn into vibrant democracies, and instead leads to the perpetuation of these regimes for decades to come. He discussed many examples of this from Libya to the rest of the Middle East, but perhaps most notably he discussed the 1994 North Korea deal as an example. That deal, commonly known as the Agreed Framework, is extremely similar to the current Iran Deal, in that it promised an end to sanctions on North Korea if they agreed to end their respective nuclear programs. However, that deal was not able to be renegotiated and fell through completely as a result. Rubin believed that at the time this deal seemed as though it was working, it later failed. In his eyes it allowed the North Korea government to live for years without any sanctions, and then by the time the deal fell through they were able to very easily acquire nuclear weapons. As a result, they now pose a very serious threat to the United States, and one that could have been avoided without negotiating in the first place. Rubin further went on about the most recent protests, as well as discuss the Islamic Revolutionary Guard Corps (IRCG) which he said controls an estimated 40% of the Iranian economy and has been likened to a terror group by many on the conservative right. This would eventually lead to President Trump imposing sanctions on the IRCG, cutting them out of the US financial system. He talked about IRCG’s significance to the region as a whole, their loyalty to the government of Iran rather than their own people, and their willingness harm their own citizens. After his talk, he opened the floor up for questions. University of Michigan Professor Victor Lieberman, whom I have written about in a previous article, asked Rubin if he believed that Iran would be able to obtain nuclear weapons after the JCPOA expired, and while he indicated his unease and suggested that it was hard to know but it was certainly likely. Rubin was also asked a question about Jerusalem and President Trump’s decision to not only make Jerusalem Israel’s capital but also move US Embassy their as well West Jerusalem. He claimed it was “a big nothingburger” and that West Jerusalem was already controlled by Israel and these protests tended to die down after a few weeks. While I disagreed with some of his points, I found the event to be illuminating, full of perspective and insight into a country and a region that will continue to be analyzed for generations to come. I thank the AEI executive council for inviting The Michigan Review and hope that more experts like Rubin will continue to be invited to our campus in the future.